Buffet lovers can start getting excited about the latest buffet promotion available at Novotel Bangkok Platinum Pratunam. The SQUARE restaurant is the place to be for the best value buffet in town. Great deals and an extensive selection of buffet favorites mean many memorable meals for diners. Every day is time for buffet! What’s on right now for the two main buffet times? The Sunday-Thursday Seafood Paradise dinner buffet is all about seafood now! Get ready to tuck into seafood fresh off the grill, served with Thai spicy sauces to get that appetite going. Try the seafood skewers, NZ mussels or pork and chicken steaks. Daily rotating menus keep the excitement high, along with delicious mainstays. Sample dim sum, fresh salmon and tuna sushi and sashimi, or grab a slice of just baked pizza. Make your own pasta, or go healthier and mix your signature salad at the salad bar. But it’s not a visit at The SQUARE without sampling the signature BBQ red pork, crispy pork belly and roast duck! The Seafood Sunday Brunch is all about seafood. Prepare to enjoy freshly shucked oysters on ice, king crab legs, NZ mussels and more. 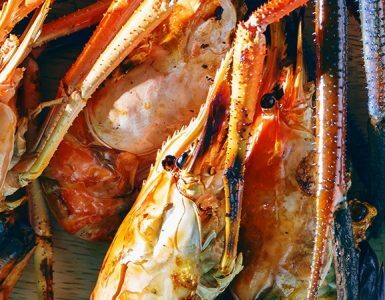 Craving grilled seafood instead? How about salmon steaks, rock lobster, prawns grilled your way? Or go for the premium meats, which include lamb chops and different meat skewers. Sunday is a day for families, so stop by for sushi, sashimi, dim sum and more! Make it a lazy and delicious Sunday with different packages and prices for every budget. 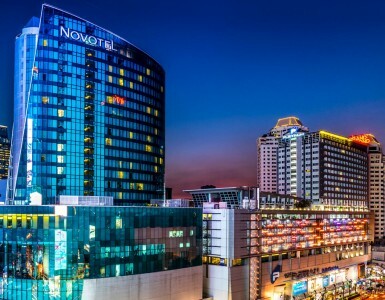 Now with the update on the latest buffet promotion to tempt your appetite, book your next meal at Novotel Bangkok Platinum Pratunam today. For more information call 02-209-1700, email h7272-fb1@accor.com or see our special offers for more details. The hotel is easily reachable through public transport, with free parking for guests available along with free wifi.